Holidays which are particularly celebrated by couples, can leave the newly divorced feeling a bit left out. A dilemma for New Year’s Eve and Valentine’s Night is whether to go out or stay home. One way to decide what is in your comfort zone is to look at the venue: A big bash on New Year’s Eve most likely includes a mix of couples and singles. A singleton fits right in and can enjoy the party atmosphere. In a more intimate gathering on either occasion, being the only one not paired up can be unsettling. If the other guests are close friends, it may not matter going by yourself. On Valentine’s Evening (or close to it), I used to have a large dessert and champagne gala when still married. The guests were divorced, married, glad to be single, or whatever. There was much laughter and luscious treats. It was a way for people to have fun without worrying about bringing a date. You might want to give a party at your place for either occasion. As the host, you are busy making sure the drinks are flowing and the food is replenished. The attendees are focused on the fare and festivities, not on your single status. One of the best New Year’s Eves I ever had, was at a party hosted by a co-worker. Most of the other party goers were single like me. Lovely not needing a dance partner. Dining out solo on these holidays may be like a scene from Steve Martin’s film, “The Lonely Guy.” His character goes into a restaurant aloneand when he tells the maître d’ a table for one, everyone stops talking to stare. A spotlight shines down on him for further embarrassment. Then two waiters loudly remove the other place settings at his table. One can view this short scene online here. Although hilarious to watch, it would be mortifying to stand out like that. An option is to meet up with a friend earlier in the day, such as for lunch or coffee to celebrate these holidays. You get out, have company, and enjoy a bite to eat before people arrive in pairs. Consider buying a treat for take away to savour later at night. I save a great mystery novel to read in the evening if I am going to be home with my cats. Chocolate helps too. The after party is where it’s at! Instead of focusing on New Year’s Eve, I make the next day special. Usually at least one son is available to see the latest film with me. We get lattes at the cinema and then eat a quick, but elegant meal at my house afterwards. Often extended families get together for a big feast and watching television. Shift your celebrating to New Year’s Day instead of the Eve. As I am packing for a pre-Christmas cruise, I am wishing it was a few weeks later around New Year’s Eve. One is among a crowd, attending events, and indulging in fabulous food. I have been on two cruises post-divorce over New Year’s Eve/Day and highly recommend it. I drank champagne and danced with many others in the balloon-filled ballroom. My sons ran around with their new friends on board and spent some time with me also. Consider getting away. My divorced friend spent New Year’s on a group tour in Asia and came back rejuvenated. Look for a retreat, outdoor adventure, hiking trip or whatever you fancy, to be out of town during a difficult occasion. These holidays can trigger one to think about what they did when married. Doing something different can be beneficial to move on after divorce. Wendi Schuller is a nurse, hypnotherapist and is certified in Neuro-linguistic Programing (NLP). 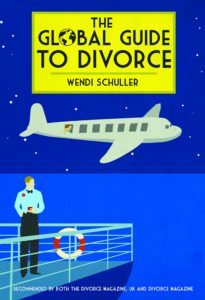 Her most recent book is The Global Guide to Divorce and she has over 200 published articles. She is a guest on radio programs in the US and UK. For other book recommendations, click here. To hear about some great reasons to be single, click here.